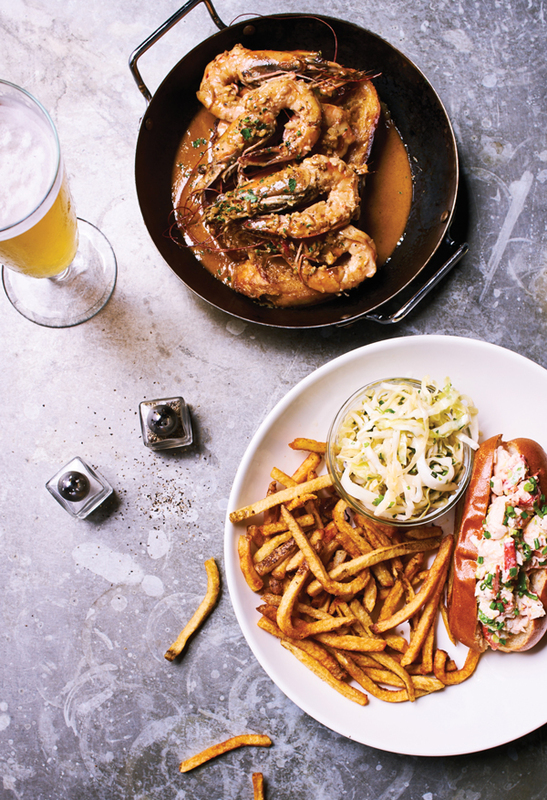 Barbecue wild shrimp and lobster roll with fries are two of the best dishes in the house. After 15 years of commuting from East Cobb to work in high-end ITP restaurants like Nava and Bluepointe, Doug Turbush decided in 2011 that it was time to open a chef-driven restaurant close to home. The local dining landscape was, as he told me recently, “kinda bleak”—a place with great schools and an affluent population, but with no place he and his wife wanted to eat. So when an East Cobb shopping center put up a sign touting Whole Foods as an incoming tenant, he called the leasing agent. If their demographic research suggested that the mall was the place for Whole Foods, it was good enough for him. After some cajoling, Turbush got the Turnip Truck, which delivers produce from about two dozen area farms, to add a distant stop to its regular ITP route. The strategy worked, and the crowds poured in. 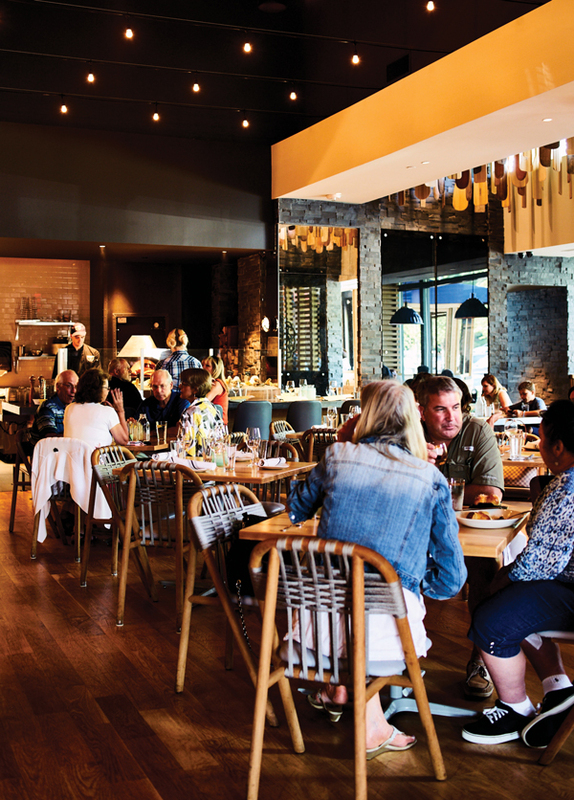 Indeed, when I visited Seed last year, I could see from the eccentric felicity of the decor alone that it was different from the kind of restaurant you usually find in a strip mall. It has a clean, Nordic look, with white bentwood chairs tipped with deep-orange feet, oversized stylized pictures of flowers and plants, and bright hardwood floors. The menu wasn’t matchingly eccentric, though straightforward American dishes like steak frites and chicken and dumplings sometimes came with the happy surprises of subtle Thai spicing, a nod to the year Turbush spent cooking in Bangkok and the home cooking of his Thai-born wife. A recent look at the menu suggests that Seed is more streamlined than it was a year ago, showing the fine-tuning Turbush told me he does regularly. The only hint of exoticism was pan-roasted blue cod with a Thai herb vinaigrette. That may be so, but over the course of three meals, I kept writing in my notes, “Doesn’t trust the ingredients.” However high the quality of the fish and seafood, Turbush seemed compelled to cloak it in a comfortingly familiar blanket. After a server took us through the day’s oyster selection, I asked if I could pick a certain one for the appetizer of wood-roasted oysters. “Oh, it doesn’t matter what you choose,” he said. “You can’t tell the difference.” So why does anyone order them? “People like the anchovy butter and the breadcrumbs.” I saw what he meant; anchovy butter woke up a piece of disappointingly mealy wood-grilled swordfish with caponata, and toasted breadcrumbs make everything taste better. But roasting the oysters with crunchy, pungent toppings relegated them to slightly chewy blobs of gray protein—so why bother starting with oysters at all, unless maybe to show how ingeniously Nature designed individual baking dishes. When Turbush didn’t play it safe, he overreached. There were two sauces where one would do and stray flavors that clashed rather than melded. An appetizer of charred octopus was glazed with black pepper jam made with sweet soy sauce, fermented black beans, garlic, and ginger; set over a Meyer lemon puree bound with olive oil; and served with sweet-and-sour braised onions cooked down in plenty of butter. Try saying that 10 times. Several of the components, like the onions, stood out, but the octopus was almost completely lost. She-crab soup should be rich, but Drift’s version seemed to be all cream, without enough Tabasco or chili oil to cut through it—let alone room for the flavor of the crab meat to register. Yet it’s clear that there’s real expertise lurking in Drift’s uneven kitchen. A special of deep-fried soft-shell crabs with peaches was one time crisp and spare, with a few sweet-tart slivers of peach to set off the natural juices of the crab. But another time it was buried in a down coat of weirdly sweet batter that masked the crab, all of it doused with breakfasty syrup. Other dishes were right on target. An appetizer of barbecue wild shrimp made the case for spice, butter, and cream to lift superior seafood, and I’d try those Georgia head-on shrimp with anything. (They were far more impressively flavored than the bigger, sometimes frozen ones the kitchen served me with sludge-thick smoked tomato grits or as a stone-cold peel-and-eat appetizer.) Bay of Fundy salmon was succulent and slow-roasted, with perkily fresh sides of spring onion, fava beans, and shiitakes. A special of Copper River king salmon, a beautiful piece of fish, was even better: tender and moist, with a ragout of just-crunchy lady peas and grilled morels. With so many customers to serve every night, it’s no surprise that the simplest dishes were frequently the most successful. Three thick and generous slices of cast-iron-seared tuna steak, served very rare and tiger-striped with white lines of fat, were painted with a citrus-soy glaze that let the succulent meat shine through. The lobster roll was a very plausible Southern contender for a sandwich that’s the pride of the North. The generous four ounces of lobster meat were moist and sweet, and whether you pick the cold version with lemon mayo or the hot one napped with melted butter, the roll will go down all too fast. Drift, then, is for now a confounding restaurant. It has a chef-owner who knows how to tool his menu to what people will order, which perhaps isn’t necessarily what he wants to cook. When Turbush offered a well-priced, seldom-seen-in-the-suburbs skate-wing schnitzel, customers, to his disappointment, ignored it wholesale. That shouldn’t deter him, and Turbush should continue to tune every dish to the standouts like the wild salmon and lobster roll—dishes you’d have to travel far to beat. 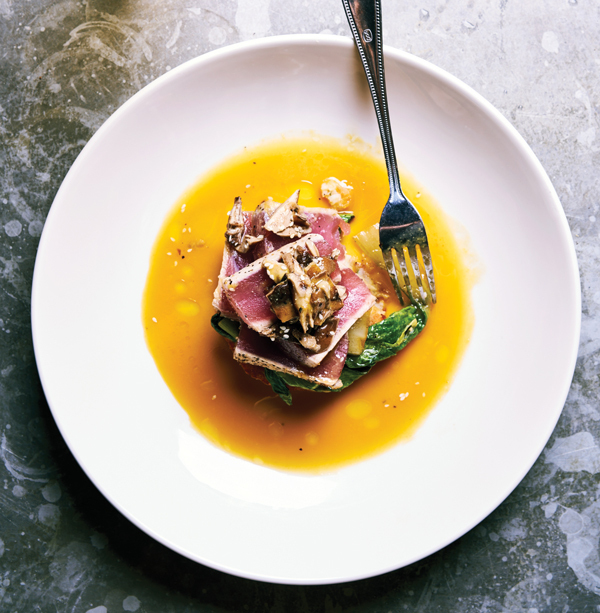 And to achieve the same thriving, chef-driven success that he reached at Seed, Turbush should fly with his skate-wing instincts and wait for his gangbusters crowds to get onboard. Gluten-free diners should ask for the special (and lengthy) menu designed around their dietary needs.